Rainbow: Have you tried this kind of presentation? Have you tried this kind of presentation? Both teachers and students have become numb to conventional classroom presentations, where they’re confronted with slide after slide containing too much information in quick, disjointed succession. 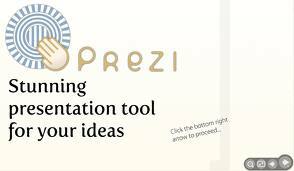 Prezi’s zooming canvas opens up the classroom to active learning and interactivity, making lessons understandable, memorable, and fun. Here is the link for those who would like to learn more. Hot New Year Greeting from Brazil!